April Fox has published articles about homeschooling, children with special needs, music, parenting, mental health and education. She has been a guest on Irish radio, discussing the benefits of punk rock on child development, and currently writes for several websites including Carolina Pediatric Therapy. Remember the old saying, "An apple a day keeps the doctor away"? There's definitely some truth to that; eating fruit every day is a first step toward staying healthy. When it comes to men's health, a banana a day may not keep the doctor away, but it will certainly help improve your overall well-being. According to the Centers for Disease Control and Prevention, heart disease is the leading cause of death for adults in the United States. You owe it to your family and to yourself to take good care of your heart, and bananas can help with that. They're packed with potassium that helps keep your heartbeat normal. Bananas also contain fiber, which has been proven to help prevent heart disease. The potassium in bananas and their low sodium content help keep your blood pressure low as well. Fiber isn't just good for your heart; it also helps keep your digestive system running smoothly. Whether you're meeting the guys on the golf course or headed to a big business meeting, you don't want sluggish digestion to slow you down. Eating a diet rich in fiber helps keep your bowel movements regular, and a banana a day provides 12 percent of the fiber you need. Fiber also helps you feel full longer after eating, reducing the chances that you'll overeat and making it easier to maintain a healthy weight. Bananas contain an amino acid called tryptophan, which is converted to serotonin in your body. Serotonin helps keeps your moods elevated and positive, so a banana a day may help fight depression. When you're stressed, your body depletes its supply of potassium quickly. Since 1 banana contains about 400 mg of potassium, eating one a day can help you stay healthy during stressful times. Bananas are rich in vitamins B-6 and B-12, which help keep your immune system strong and healthy. B vitamins also help keep your nervous system in good working order. 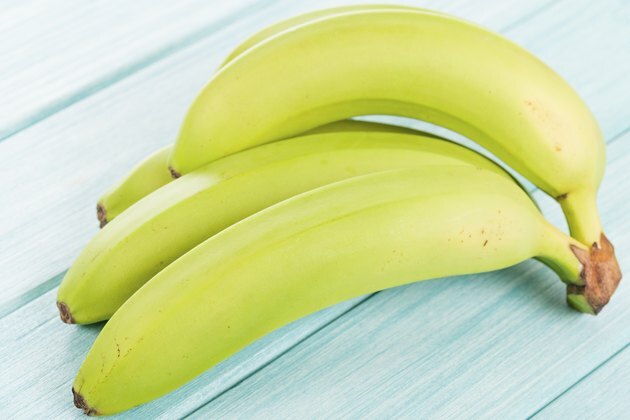 A banana a day can even help you quit smoking; vitamins B-6 and B-12 work along with the potassium and magnesium in bananas to help you get over nicotine withdrawal more quickly. It's a breeze to peel and eat a banana. They're easy to pack away, and you don't have to worry about juice or crumbs, so they're an ideal snack to eat on the go. If you get tired of eating a banana every day, try something different. Slice it and put it on your cereal, oatmeal, yogurt or even ice cream. Mash some bananas and add them to breads and muffins. Bananas add flavor, nutrients and texture to smoothies that you make at home. With all of the ways you can eat a banana, and all of the health benefits, it's simple and smart to have one a day. Is Eating a Lot of Bananas Healthy? Are There Benefits of Banana Milkshakes?